Tauranga’s stunning waterfront is an extremely inviting location for a summer retreat. The Strand, Tauranga’s main hospitality destination, hosts a variety of bars and restaurants that can be explored as you enjoy the bright lights of the cityshimmeringoff the harbour. The waters of the Bay of Plenty play an important part in any trip to Tauranga. The region is known to offer encounters with humpback whales, orcas, seals and bottlenose dolphins. For those looking for a more up-close-and-personal experience, a number of local providers give you the chance to take an unforgettable swim with the dolphins. Keep an eye out for large-scale works by the internationally renowned street artist Owen Dippie, a local resident of Tauranga. Tauranga is also coloured by ‘Greerton’s yarn bombing craze’, and as a result many local trees, bollards and street signs are encased by knitted decorations. To further explore the local art scene head to the Tauranga Art Gallery, which features both international and local exhibitions. As the busiest city in The Bay of Plenty, Tauranga is the perfect place to explore all the natural wonders this region has to offer. Take a short drive to explore ‘The Mount’ (a.k.a. Mt Maunganui), a dormant volcano with stunning 360-degree views at the top and salt-water hot pools at the bottom. Tauranga is also a short drive from three beautiful waterfalls: McLaren Falls, Omanawa Falls and Kaiate Falls. 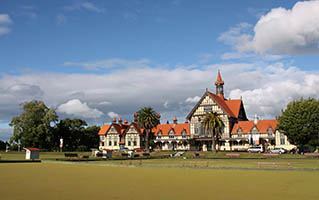 Don’t have long to spend in the Bay Of Plenty? Plan your trip with our guides to the scenery, art and experiences that can’t be missed.